I’m gonna start with makeup products, because I was the most curious especially about this new mascara. 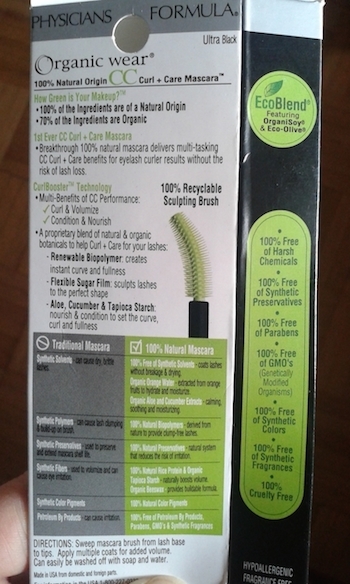 I have a fetish about Organic wear mascaras and I want to try them all, till now I have tried 3 of them and liked all. The only thing I’m not so happy with, is that they all dry quite quickly. I won’t spend many praises about beneficial ingredients and marketing promises from the package which you can see here on the picture. 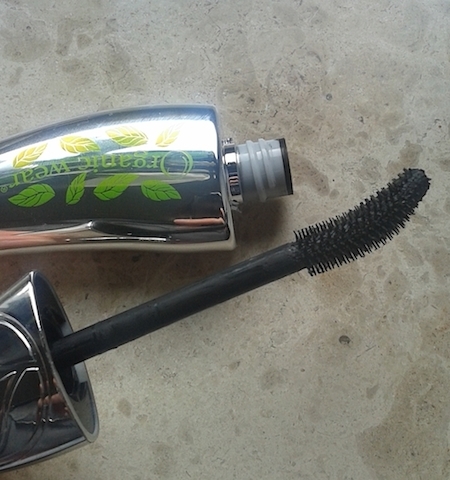 I’m going straight to share my thoughts: I like very much this Organic wear CC mascara (CC means curl & care), because if you are able with the wand you can get beautiful curled and voluminous lashes, very dramatic for a green mascara! No clumping, just volume and curling. Love it, except that it dries quite quickly, in less than a month I noticed that the wand was quite dry. Here is the curved and clean brush very close, that separates the lashes fabulously. With those curved mascaras I advise you to really curl the lashes from the roots and massage them where can help you very much the shape of the wand. Perhaps I should do a video to explain it best 🙂 It’s really good to understand the point of these type of wands. In comparison to the similar mascara from SObio that I reviewed time ago, I prefer this one because it separates more the lashes and gives that vavavoom effect. On the picture above there is a swatch on daylight which is not so well seen. 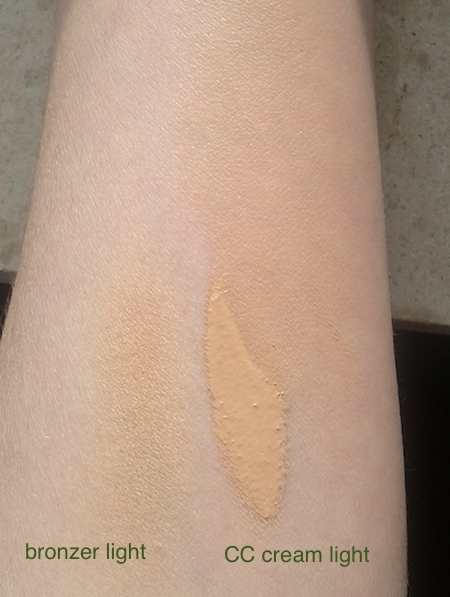 Well, the colour is a mix of slightly shimmery beige and a medium sand with golden warm tonality, which in general does a nice not overdone sun kissed effect on fair skin. It’s great because this one is not orange! As you can see from the picture the bronzer is lighter than the CC cream, which is not ok, since both products are for light skin. Note that the picture was taken on daylight and so the bronzer looks more shimmery and gold than it is. I’m not a fan of shimmery bronzers, so this one is ok for my taste because it has just a hint of glow. 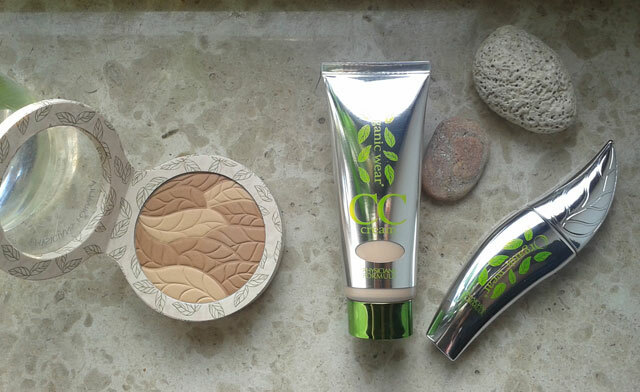 It is Ecocert approved as well and the list with ingredients is very good (no talc, no parabens, no synthetic dyes,…). Here is another picture of the bronzer that comes in a typical lovely package from Organic wear; included a mirror and brush on the other side of the package. My new hair conditioner, a very green, new and fabulous product that I’ve tried recently. 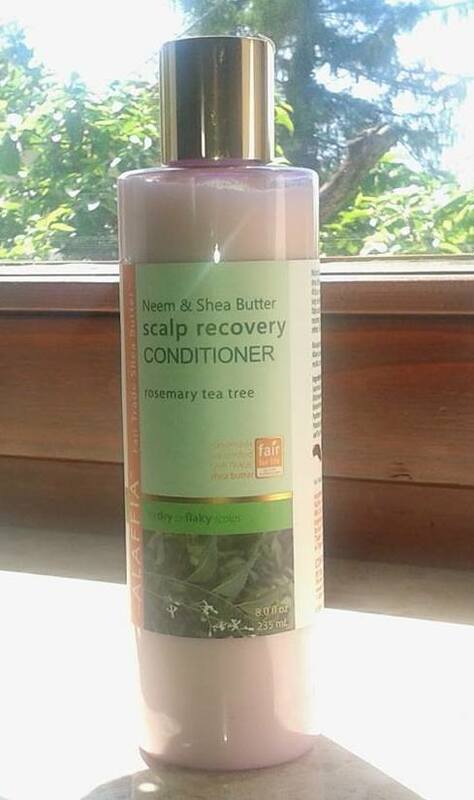 It’s especially good for dry scalp. It smells divine, herbal scent of tea tree. 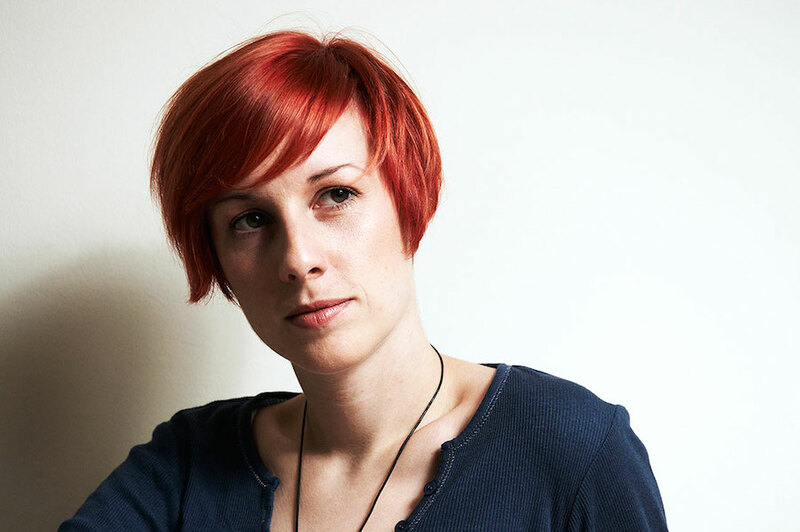 It has a light mousse-like texture and it detangles the hair excellently! Love it! Much better than high end green brands. Before ordering this one I got and tried the travel size of Rahua conditioner and really was not so so good in comparison with this, so the decision was quickly made and very good at the end. I like the quite strong scent of this one, that perhaps someone won’t like. The texture is almost like a light mousse that detangles hair quickly and gently, plus it has beneficial properties for the scalp. I will also try their shampoo from the same line. All of you who want to shop on Iherb.com put the code DAS325 and get a discount of 5-10$ on your first order. Great review 🙂 love it ! I recived a bronzer/blusher from Physiancs Formula a couple of days ago. 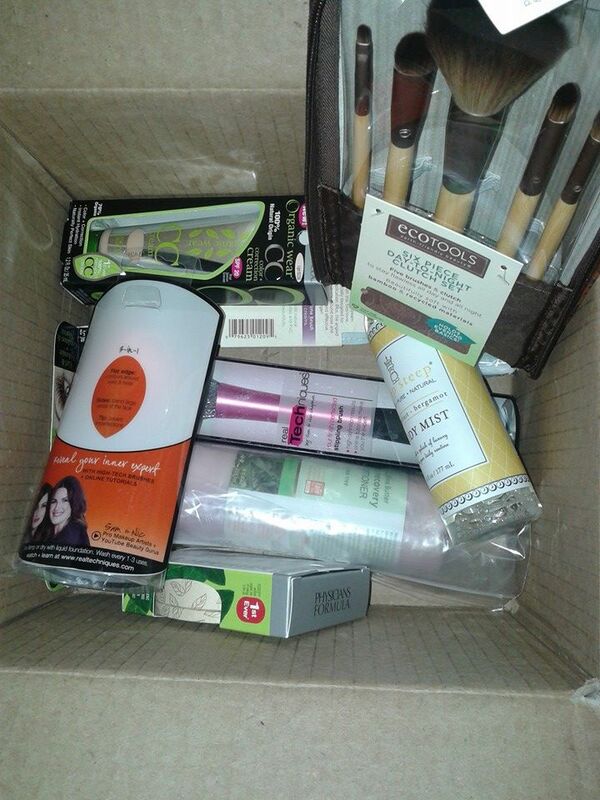 I also ordered from IHerb and I really like it. I like to put this CC cream on clean skin, but it is true, that i can not imagine put anything else on top or underneath it (except the setting powder of course).